Serve with tortilla chips for dipping! Heat and stir the soup, beans, chili powder and cheese in a 2- quart saucepan over medium-high heat for 2 minutes or until the mixture is hot and the cheese is melted. Sprinkle with the green onion, if desired. 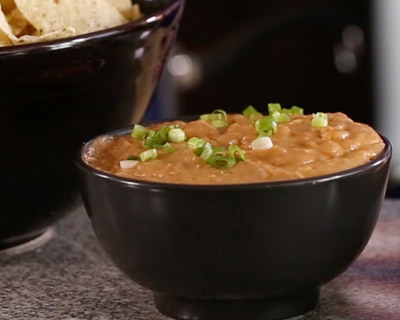 To prepare in the microwave, stir the soup, beans, chili powder and cheese in a large microwavable bowl. Cover and microwave on HIGH for 3 minutes. Uncover and stir. Microwave, uncovered, on HIGH for 2 minutes. Stir before serving.